It was the grunt of the Great Blue Heron that did it. Taking small, gawky steps, it surveyed the edge of the island, its Pompadour headdress elegant but slightly deflated, like a second-hand evening gown. Through the binoculars, it looked back at me—”glare” would not be too strong a word—and let out a series of primeval grunts that seemed to emerge deep in its gut, grate all the way along its 22-inch neck, and scrape out its beak. The Great Blue’s complaint filled me with wonder: a sound both ancient and awkward, it seemed to reach back through the millennia to the dinosaurs where the bird’s genetic material lays evolutionary claim to a prehistoric pedigree. Something about the way The Great Blue moves, the way it grunts, belongs more to a dimly imagined moment in the planet’s past than it does to the touchscreen-obsessed cultural period in which it lives. Great Blue’s territorial rebuke—take those binoculars and get out of here—could not have been more pointed. I moved on, feeling as if we’d shared a privileged confidence. And we had. The glare from the Las Vegas Strip hides more than the stars—with its frenetic signage and breathtaking lights, this four-and-a-half mile chunk of real estate obscures almost every other aspect of the metropolis. Like a nonstop talker at the dinner table, one who quashes every other conversation, the Strip holds forth, transfixing some, boring others. I’ve ceased asking myself: where did this X come from? Why haven’t I heard anything about X? How come there’s no information on X readily available? The Strip dominates all communication. Although the city’s economic fortune depends on its world-renowned image, the steady stream of tech heads from California sitting around the poker table want more than a winning hand and a new cocktail. The fact that the 2900-acre Wetlands Park Nature Preserve is 15 minutes from the Mandalay Bay Hotel and Casino and yet is virtually unknown among visitors and locals alike has, I suppose, worked in the habitat’s favor. The Great Blue Heron and its brethren, the Cinnamon Teal Duck and Great Horned Owl, appreciate their privacy, along with the beavers, bobcats, cottontails, raccoons, coyotes, lizards and snakes, the delicate species of butterflies. Even the unattractive plecostomus fish—which apparently swam up from the Colorado River with great determination—has found an ideal home in the midst of an urban center often dissed for its lax environmental policy. While the Las Vegas Wash has been the site of a wetlands for more than 10,000 years, it only became a park in 1993. One of the largest and most successful water reclamation projects in the nation, filtered water from the adjacent treatment facility—185,000,000 gallons of it per day—takes the relay from the ancient aquifer. Polished as it flows, the water feeds into Lake Las Vegas and then into Lake Mead, where it makes the trek back up to the city to begin the water cycle again. 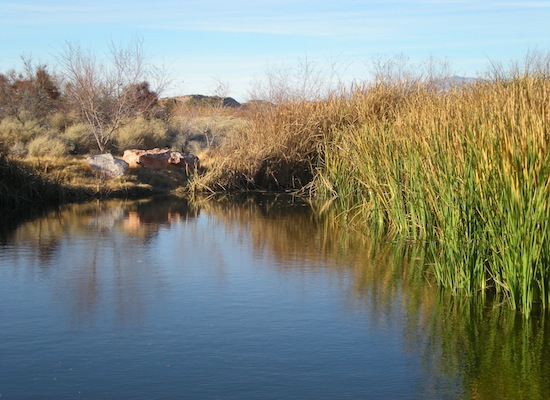 In common with Las Vegas’ other impressive resources, the Wetlands Park Nature Preserve has various unfinished projects onsite, including a state-of-the-art green architecture visitor’s center, planned during the economic boom and struggling to cross the finish line. The park itself features idyllic wooden shade stations with postcard views of the landscape; inviting wooden bridges meandering over the water; Zen-garden inspired look-outs; a few miles of paved path; and miles of trails around the creeks, ponds, river and marshes. And there’s hardly anyone there. This entry was posted in Nature and tagged beavers, binoculars, bird-watching, casino, cocktail, Colorado River, cottontails, coyotes, desert, dinosaur, Great Blue, habitat, Lake Las Vegas, Lake Mead, locals, Mandalay Bay, marshes, Mojave, nature, oasis, park, poker, pond, privacy, reclamation, river, signage, snakes, Strip, Vegas, wetlands, Zen. Bookmark the permalink. Excellent feeling. I enjoy the Wetlands Park and have mixed feelings about sharing my secret oasis. I know–I feel that way, too. Thanks for your comment.